Q: Who do I contact for hotel reservations? A: All hotel reservations (Including shoulder nights) will be made by your hosts, Sue/Josef/Tommy. 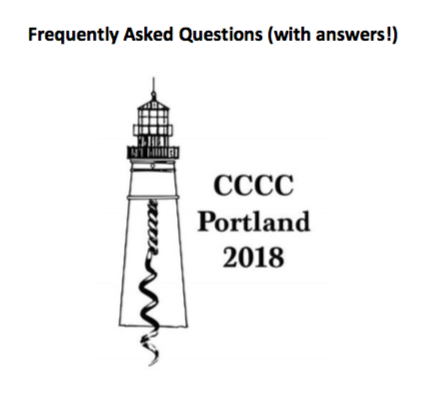 Please fill out the registration form and email it to Sue at: mycccc2018@gmail.com. If you need to make changes after you submit your form please email those changes to Sue at the same email address listed above. Q: Which airports are best to fly into? Q: What are my transportation options once I arrive in the New England area? A: There is very little public transportation in Maine. There is bus transport from Boston to Portland, but as of today there is no rail service. However, there is talk of Amtrak adding a line from Boston to Rockland (with a stop in Portland) this summer and early fall. If that does indeed happen Sue will update this information. Your best bet is to rent a car for your travels and consider carpooling to share the cost. Q: Does the Portland Regency Hotel provide a complimentary shuttle service from the Portland (PWM) airport to the hotel? A: Yes, you will need to call the hotel at: (207) 774-4200 once you land and they will send a shuttle for you. Q: Does the Portland Regency Hotel offer valet parking? A: Yes, the cost to you is $20 per day. A: September in Maine is one of the most beautiful months of the year. Typically warm days and cool nights. Please consider bringing a light weight jacket or coat and you might consider a hat – just to be on the safe side! Q: How do we get to Vinalhaven? A: Once we know how many people are attending the meetings and how many will be coming to Vinalhaven for the L’Africain Open House we will explore transportation options to get people from Portland to Rockland and back again. Departure time from Rockland is 10:30 AM. Everyone will walk on the ferry; you do not want to bring your car. The ferry will dock on Vinalhaven at 11:45. (Please note: it’s an hour and a half to a two hour drive from Portland to Rockland). Q: Is there parking at the Rockland ferry terminal? A: Yes. The cost to park there is $10 a day. Q: How will we get from the Vinalhaven ferry terminal to the L’Africain’s? Q: What are the lodging options on Vinalhaven? Q: If we don't stay on Vinalhaven what are our lodging options in the Rockland area? Rockland Harbor Hotel is located directly across from the ferry terminal. 250 Main Hotel is located about a 10-minute walk from the ferry terminal. There are many nice B and B options in Rockland including the Granite Inn which is located directly across from the ferry terminal. (Note: Do not stay at the Tradewinds in Rockland. You will be very disappointed).